2017 was a year marked by uncertainty. A new President took office in the United States, and corporate tax reform became a hot button topic. Britain triggered Article 50 to formally begin the Brexit process, with companies inside and outside the Eurozone trying to plan for several possible contingencies. And the global economy improved overall, growing at a greater rate than in 2016. While those in some regions of the world saw reasons to be excited, others had cause to be a bit more cautious and guarded. 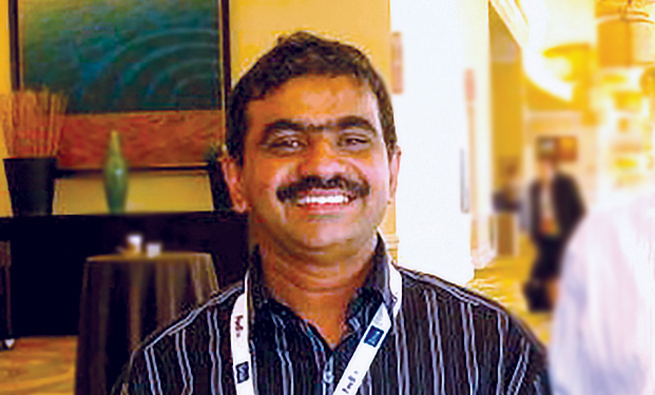 So how did members of IMA® (Institute of Management Accountants) fare during this time? What kind of impact did events large and small have on their jobs and compensation? IMA’s annual salary survey looks to provide answers to that very question, identifying trends in compensation and other job- and career-related factors among the global IMA membership. The survey included a total of 2,420 usable responses coming from 62 countries across the globe. Figure 1 lists the countries that contained at least 1% of survey respondents along with their median salary and total compensation. (All monetary values are in U.S. dollar equivalents as of the time of the survey.) Similar to the composition of IMA’s membership, the countries with the highest number of respondents are the United States (50%) and China (22.8%). Table 1 summarizes the prominent demographics of all respondents from the various regions of the Americas, Asia, Europe, and Middle East/Africa. Consistent with prior years, more men responded to the survey than women. But the proportion of women did increase in some regions. In the Americas, it increased from 38% last year to 41% this year. And in Asia, not only did the percentage of female respondents increase from 46% last year, but the 51% means there were more female respondents than male respondents in that region. Overall, more than half of the respondents (56%) hold the CMA® (Certified Management Accountant) certification, which is consistent with prior years. Last year, it was 55%. The Americas have the highest percentage of CMA respondents at 63%, which is up from last year’s 58%. The overall average age is 40 years old, which fits with the high percentage of respondents reporting to be in middle-management positions (42%). Respondents in the Americas report the highest average age (45), while those in Asia and the Middle East/Africa regions have the lowest (34). 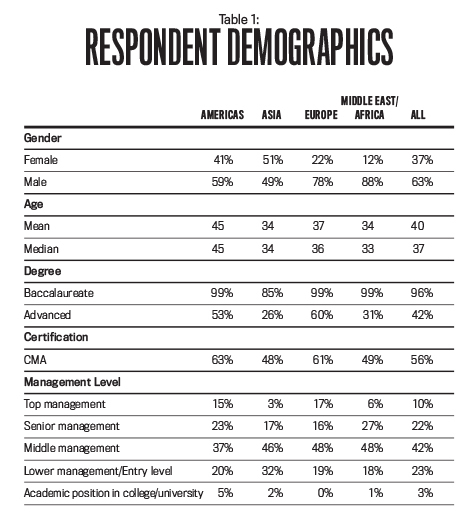 The Middle East/Africa region also reports one of the highest percentages of respondents in middle- to top-management positions (81%), which suggests that respondents in this region are being promoted at an earlier age. Table 2 presents the mean and median annual salary and total compensation for each major region and the median change over last year. The global mean and median base salary are $74,344 and $66,000, respectively, down slightly from $79,278 and $68,675 last year. Overall, mean and median total compensation also are marginally lower than last year: $95,368 and $73,000 this year compared to $97,475 and $73,675 last year, respectively. The decrease in global salaries could be due to a significant increase in the number of younger respondents from the Americas and Asia. The Americas reported a 22% increase in the number of respondents between 20 and 29 years old, while Asia had an 86% increase in the same age group. Readers should be cautious about making comparisons of their salary to the global results and focus more on regional or country results. The results across the regions vary significantly. The region with the highest median compensation was the Americas, followed by Europe. These were also the only two regions that didn’t show a decline in salaries compared to last year. Salaries in the Americas held steady, and those in Europe increased—a change from last year when Europe was the only region that didn’t show an increase in salary. All other regions decreased in median base salary, with Asia showing the largest decrease (27%) compared to the previous year. The decline of both median salary and total compensation in Asia may be driven by an increase in the number of female respondents. As we’ll see, women’s total compensation in that region is only 78% of that of their male counterparts. One of the most notable observations within the regions is in Middle East/Africa, where median salary declined for a second straight year. The 13% decrease reported this year follows a 6% decrease last year. Yet a few countries in the region showed significant increases in median base salary, including Jordan (27%) and Lebanon (51%). 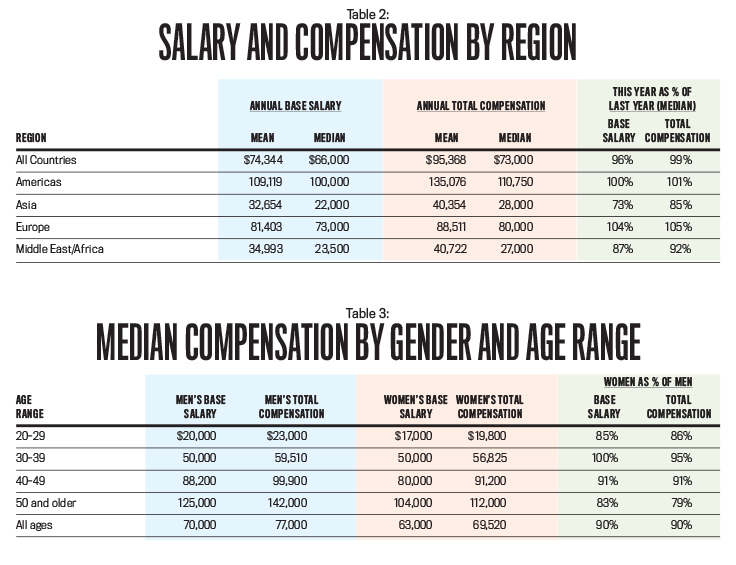 Table 3 shows the median compensation by gender and age range. The percentage of women’s compensation in proportion to men’s compensation—what we call the salary gap—has improved slightly from last year. The gap is 90% in both median base salary and in total compensation, modest improvements over the respective 89% and 84% from last year. Though this is the second year in a row that the gap improved, the increase unfortunately did not prevail across all age groups or regions. The most significant comparison from prior years is in the 20-29 age range, where women’s median base salary was 15% lower than the median base salary for men in the same age group. This is a reversal from last year, where the women’s median base salary was 50% higher than that of their male counterparts. The salary gaps in the median base salary in the 30-39 and the 40-49 age groups are improved from last year. For example, the gap in the median total compensation in the 30-39 age group went from 84% last year to 95% this year. Figure 2 shows the salary gap by region and age group. In the Americas, the salary gap is fairly consistent across age groups, with the smallest gap in the 20-29 and 30-39 age groups (86%). The largest gap was reported in the 50 and older age group (75%). This trend is generally consistent with the salary survey findings over the years and points toward the “glass ceiling” phenomenon often referenced in the U.S. In Asia, the overall salary gap is 78%. The most significant change compared to last year is in the 20-29 age group. Last year the salary gap for this age group was 92%. This year, it’s 75%. Some of this difference might be attributable to the increased proportion of female respondents in the Asia region this year and the fact that they are generally in lower-level management positions while a greater proportion of their male counterparts are in higher-paying upper-management positions. Europe reports the highest overall gap of all regions (67%). This is driven by the fact that in the 40-49 age group, women’s median total compensation was less than half that of their male counterparts (48%). 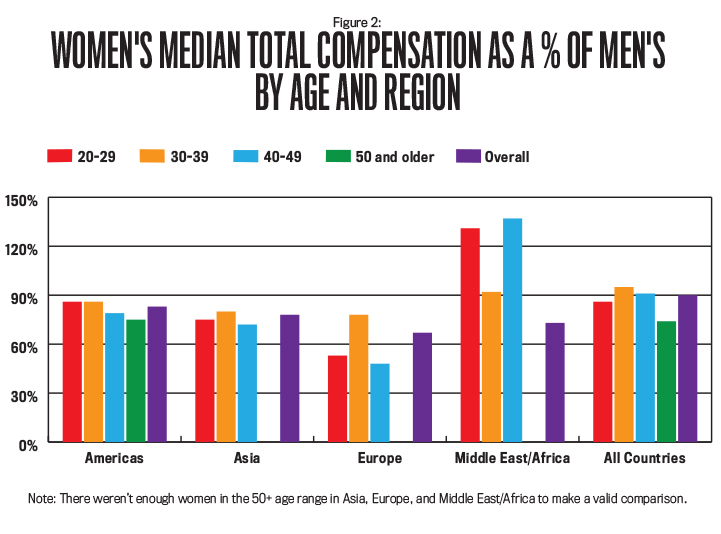 The Middle East/Africa region is the only region that includes categories where women’s median compensation exceeded that of the men. Women ages 20-29 earned 131% compared to men in that group, while the median compensation for women ages 40-49 is 137% of that of their male counterparts. Globally, CMAs earn 62% more in median salary and 67% more in median total compensation than non-CMAs (see Table 4). That’s an increase over last year, which reported CMAs earning 45% more in median salary and 50% more in median total compensation. Some of this increase could be partly attributable to a shift in the percentage of CMAs across regions. 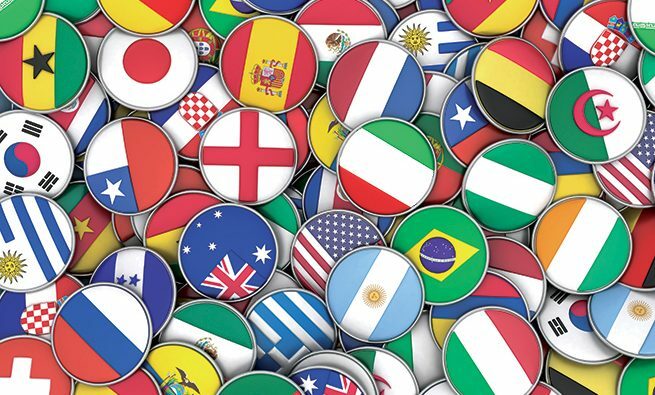 The Americas reported a 5% increase in the number of respondents holding the CMA, while the Asia and Europe regions reported decreases of 3% and 4%, respectively. Overall, CMAs tend to be a little older, have more years in the field, are at higher management levels, and are more likely to have a graduate degree. 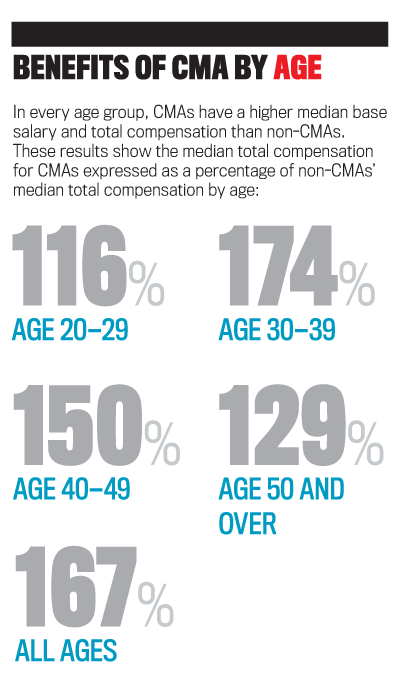 In every age group, CMAs report higher compensation levels. The most impressive difference is in ages 30-39, where CMAs show a 71% higher median salary and a 74% higher median total compensation. 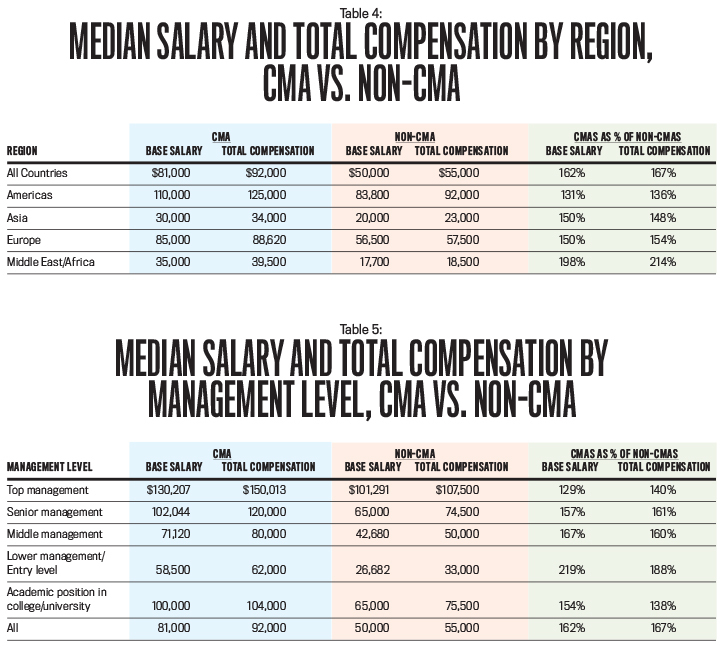 When comparing median salary and total compensation across management level, Table 5 shows that CMAs consistently earn more than non-CMAs at every level. The most notable difference is for participants in lower-level management positions. Those holding a CMA in lower-level positions have a median salary that is 119% greater and median total compensation that is 88% greater than those of non-CMAs at the same level. Often employers offer increases in compensation immediately after someone earns the CMA, which could explain the large difference at this management level. 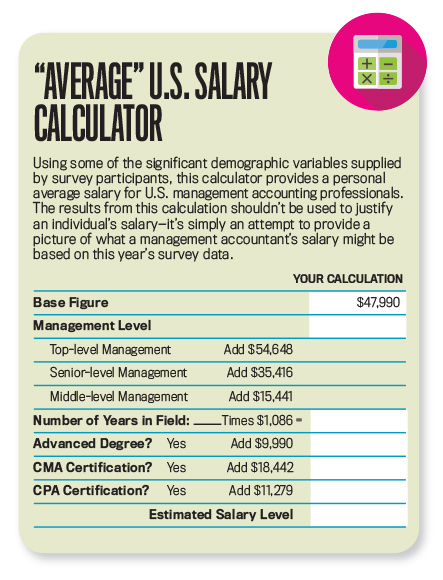 Figure 3 takes a deeper look at the impact certification has on compensation in the United States, showing the median total compensation for respondents in the U.S. who hold the CMA, CPA (Certified Public Accountant), or both compared to U.S. respondents with neither certification. 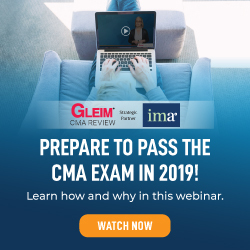 Approximately 42% of respondents hold the CMA certification only, 8% hold the CPA certification only, 20% have both the CMA and CPA, and 29% have neither. Overall, those holding only the CMA report 47% higher median total compensation than respondents with neither certification, while those with only a CPA report a 40% higher median total compensation. Because the CMA and the CPA validate different skill sets, those with both the CMA and CPA certifications should presumably have a wider range of skills. The results support this: The median total compensation for those with both certifications is 59% higher than for those with neither certification. The results are mixed within age groups, though some of that variation could be attributed to the small sample size in some of the groups. To gauge how the CMA provides benefits beyond salary and compensation, the survey also asked CMA respondents (and those pursing it) additional questions about their experiences with the certification. Overall, 87% of CMAs agreed that CMA certification strengthens their ability to move across all areas of business (see Figure 4). In addition, 75% of the respondents currently pursuing the CMA cited “career advancement” as the primary reason. 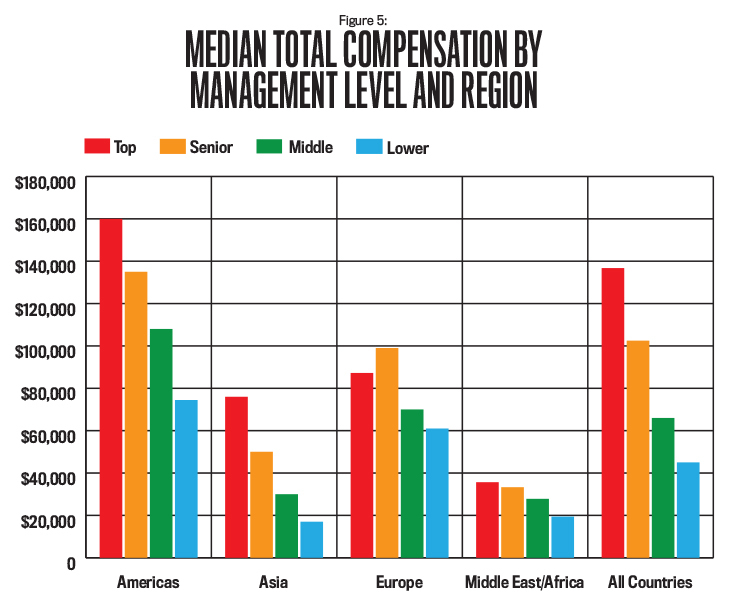 Figure 5 presents the median total compensation by management level and region. As reported in Table 1, 10% of the overall respondents report being in top-management positions. These respondents earn a median total compensation of $136,750, compared to $102,500 for senior management, $66,000 for middle management, and $45,000 for lower management. These results vary by region. 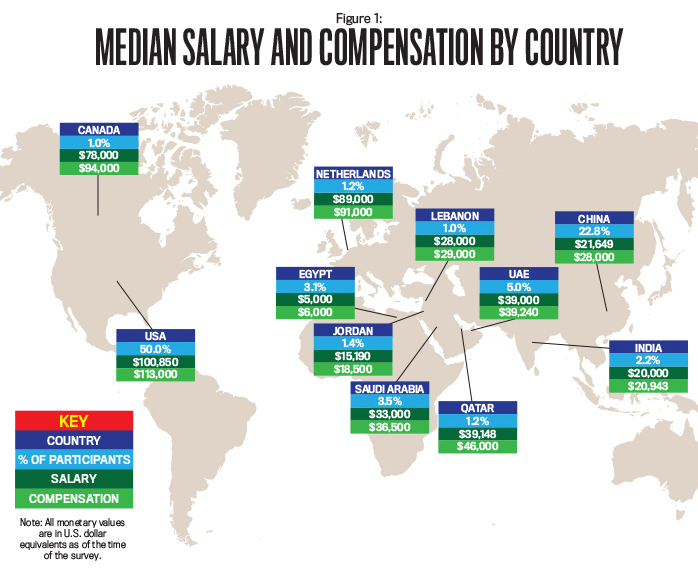 For example, the median total compensation for those in top management in the Americas is $160,000, followed by $87,240 in Europe, $76,000 in Asia, and $35,650 in the Middle East/Africa region. As you might expect, total compensation increased by management level in almost every region. The one area where this doesn’t hold true is in Europe, where the median total compensation for respondents in the senior level ($99,000) was higher than the median for those in top management. This might be attributed to the small amount of respondents in these groups. In addition to compensation, respondents were asked to assess their overall job satisfaction with different attributes related to their job (see Table 6). Overall, job satisfaction has increased slightly with 58% of respondents expressing some level of satisfaction with their job compared to 56% last year. As with last year, respondents reported being most satisfied with their working relationships (75% this year vs. 74% last year). After that, however, there’s a bit of a gap at the top, with job security (60%), the opportunity to do interesting and challenging work (59%), and the way their employer handles ethical issues (58%) bunched together. All those percentages are a couple percentage points higher than reported last year. The biggest difference among the factors was work-life balance. Last year, it was a close second, with 73% expressing some satisfaction with that aspect of their job. This year, however, it’s fifth, at 54%. This decline is seen in all regions but is especially notable in Asia, where satisfaction with work-life balance decreased by 32%. A correlation table revealed the factors most correlated with overall job satisfaction are salary, benefits, and work-life balance. This is consistent with the results when respondents were asked about the importance of each factor. The most important factor identified by the respondents was salary (78% of respondents considered it important), followed by work-life balance (76%) and benefits (74%). When comparing current levels of satisfaction and the importance the respondents placed on each factor, work-life balance had one of the greatest differences: 54% of respondents expressed some satisfaction while 76% said it was important. Job satisfaction and the factors impacting it vary among the regions. For example, in the Americas, overall job satisfaction increased from 53% last year to 71% this year. The percentage of participants satisfied with their benefits and salary increased from the prior year (increases of 24% and 22%, respectively). The only factor that had fewer participants expressing satisfaction was work-life balance, which decreased by 8%. Respondents in Asia reported significantly lower overall satisfaction (40%) compared to last year (64%). In fact, satisfaction with all listed factors decreased in this region. Respondents were much less satisfied with salary (31% decrease), benefits (39% decrease), and work-life balance (32% decrease). 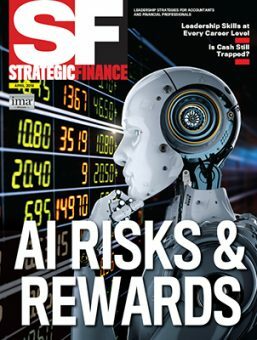 “Adding value and learning new things are also very important to me.”—a corporate controller in the U.S.
“I have some flexibility with my work hours, which is important to me.”—a financial analyst in the U.S.
One factor affecting job satisfaction is opportunity for advancement, which often comes with pay increases. Based on the survey results, approximately 69% of all respondents received a pay raise within the past year. This result is consistent across regions. The median raise was 6%, which is up slightly from last year (5%). Regionally, raises in Asia and Middle East/Africa tended to be larger (with a median of 10%) than those in the Americas (4%) and Europe (6%). There’s also optimism for future raises. 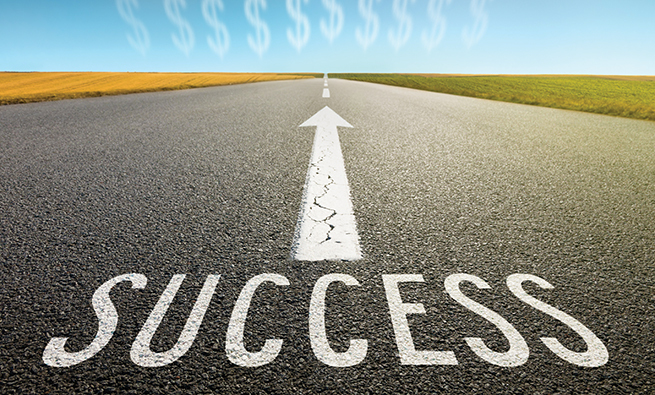 Approximately 79% of the survey respondents expect a pay raise in the coming year. The anticipation is highest in the Americas (85%) and lowest in Middle East/Africa (69%). As shown in Table 7, survey respondents worked an average of 45.1 hours per week, which is a small decline from last year (45.5). U.S. respondents reported the longest work week at 46.3 hours, up from one of the lowest last year of 45 hours. Next were India and Jordan, both with averages of 45.5 work hours. The countries with the shortest reported work week were Qatar (41.6 hours, down from 45.1 last year), China (43), and Canada (43.4). None of the countries or regions listed in Figure 1 reported an average of less than 40 hours of work per week. While the median salary and total compensation for respondents to this year’s IMA salary survey declined, don’t worry about what that might mean for your salary future. A number of the changes in this year’s survey of IMA members can be attributed more to the shift in the demographics of the respondents than external factors. The increase in the number of younger respondents, in particular, likely impacted the overall salary numbers and influenced several of the noted salary and compensation comparisons. For example, the number of respondents ages 20-29 in Asia increased by 86%. This same region reported significantly lower salaries and significantly lower job satisfaction compared to last year. Even with a younger set of respondents, the proportion of CMAs participating in the survey increased, which indicates that IMA members are considering—and earning—the certification sooner in their career. At the same time, the difference in salaries and compensation of CMAs compared to non-CMAs continued to grow this year. With salaries increasing for CMAs while the certification gains greater representation in the younger age groups, the value of the CMA continues to trend in a positive manner. It will be interesting to see in future years how these young CMAs experience those enhanced benefits through the rest of their careers. We would like to extend a big thank-you to all those who responded to this year’s salary survey. The more participation we get, the more accurate and meaningful the results. We are truly grateful for your continued support. Look for country and region reports to be posted soon at www.imanet.org/salary_survey. 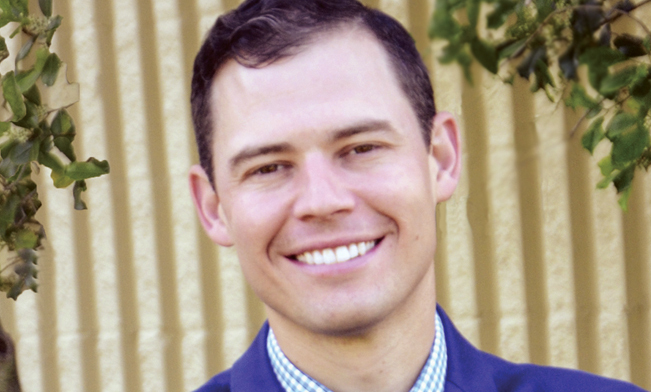 Shannon Charles, Ph.D., is an associate professor (lecturer) at the University of Utah. 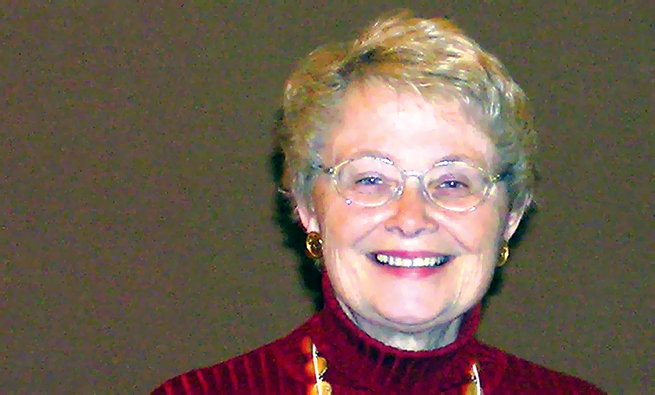 She also is a member of IMA’s Salt Lake Area Chapter. Shannon can be reached at (801) 587-9546 or s.charles@utah.edu. I believe the following is accurate. Take a look at bachelor’s degree “Top Level” and Middle Management”. Perhaps life choices affect position and accomplishment to some degree. I urge reporting of a comparison of compensation of CMA holders by gender. The last I saw, several years ago, Women were slightly higher than men. I did not find a comparison of salaries by gender for those holding the CMA. Did I miss it? NOTE: No, you did not miss it. We have space limitations in the print version of SF. Please go to: https://www.imanet.org/career-resources/salary-information?ssopc=1 and click on the USA icon. It will take you to a more in-depth salary survey report. Table 13 has comparisons of total compensation for male and female CMAs. Hope that helps. sample sizes are not big enough to tell the true story about financials salaries especially at the age of big data. i am expecting improvements in next survey.